Over on Facebook I’ve mentioned once or twice that we’ve been getting a lot of rain. I should specify: by a “lot of rain” I mean that if we get much more, animals are going to start going by two-by-two. What we are experiencing is abnormal, even for rainy season. Here’s a video showing a community that was pretty much completely under water this morning. The name of this community is “Beira Rio”, and it is roughly three miles from our house. It is also one of our routes to church, depending on who we have to pick up. Needless to say, we didn’t take this route. Indeed, we almost didn’t take any route. Almost everywhere we turned, roads were blocked due to flooding, or, in one case, to fear that a bridge might collapse. 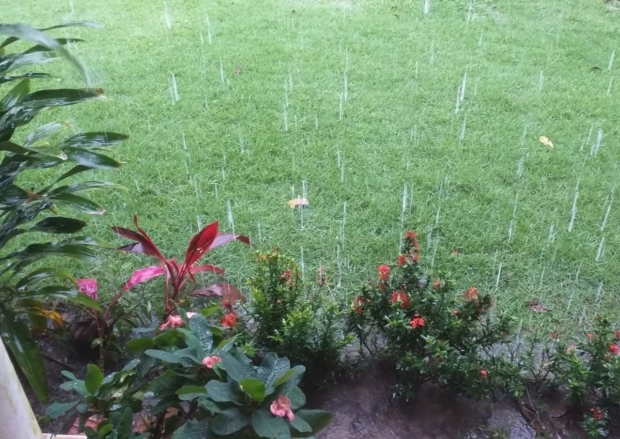 This video shows flooding at a nearby water (!) park that is located on another route to the church. We didn’t go this way either. Finally we found a back road that got us around the major blockages and to church. The service was a blessing, Pastor Francivaldo brought a challenging message, and everybody got back to their homes safely. But one of our sister churches in another part of the island had to cancel their services. We appreciate your prayers as we navigate (literally) an unusually wet rainy season. Fun fact: the rainiest month of the year down here is generally April! Also, for those who are wondering, there is very little chance we will get flooded out. Our house is on high ground, with no rivers or lakes nearby.